Homeowners planning to remodel their home would be well-advised to contact their insurance agent, broker, or insurance company representative early in the project planning process. Why? Homeowners need to ensure that they have all necessary insurance coverages during ̶ and after ̶ their renovation project. Be proactive. Call before the renovation project begins. If you wait until after your home renovation project is underway, you could find yourself dangerously underinsured if the worst-case scenario were to play itself out. Discuss your remodeling plans with your insurance company. Ask if you will need to update your homeowner’s insurance and whether you need other types of insurance to protect your legal and financial interests during the renovation project. If you are planning a simple, do-it-yourself (DIY) renovation project, you should only tackle the work that you are qualified to perform. If friends or family are going to volunteer their labor, make sure that you have sufficient liability protection in the hopefully unlikely event that someone gets injured. Consider raising the amount of no-fault medical protection on your home insurance policy so that if someone is injured, he or she can simply submit the doctor’s bills to your insurance company. If you are planning a larger project, consider a builder’s risk policy (also known as a “course of construction” policy). It may be available as a stand-alone policy, or as an add-on to your existing homeowner’s policy. This coverage generally protects a home from damage incurred during construction, including wind and rain, theft of materials such as carpeting, tile or wood (though not the contractor’s equipment), and vandalism. Why is it important that your insurance company knows about the improvements to your home? Simply put: Ensure that you have adequate coverage(s) to protect your financial interests. That is, after a major renovation, you may need to increase the amount of insurance coverage you carry in order to rebuild your home to the new, improved quality standards. Consider purchasing additional coverage for your personal possessions. If you have purchased art or other expensive items as part of your remodeling project, find out whether you should purchase additional coverage in the form of a floater or an endorsement. This is an individual policy for expensive items that provides a higher level of insurance coverage. Consider purchasing additional liability protection if you added a swimming pool or hot tub as these are considered “attractive nuisances” and could leave you vulnerable to lawsuits from others injured on your property. You may want to ask your insurance agent about getting an excess or umbrella liability policy as a cost-effective way to increase your overall liability protection. Don’t be shy. Inquire about premium discounts. That is, you may qualify for a discount of at least 5 percent if you installed stronger doors, smoke detectors, a burglar alarm, or dead-bolt locks. Some companies may reduce your premiums by as much as 15 or 20 percent if you install a sophisticated, monitored sprinkler system and a fire and burglar alarm system. If you updated the heating, plumbing, or electrical systems, you may qualify for a reduction in your premium, as these reduce the risk of fire and water damage. Adding storm shutters or shatter-proof glass, reinforcing your roof, or purchasing stronger roofing materials may also reduce your insurance premiums. If the alterations and improvements to your home were a result of a major change in your life such as a marriage, the addition of a new child, establishing a home-based business, or an elderly relative moving into your home, you may also need to reevaluate a number of other insurance needs. Now is a good time to discuss these major life events with your insurance professional to see if you should update your life insurance, get business insurance, or secure other coverages. *CAVEAT(S): J&R Construction does not seek to provide insurance advice, nor does it endorse any insurance product or company. This is not intended as legal or financial advice, nor should it be considered as such. 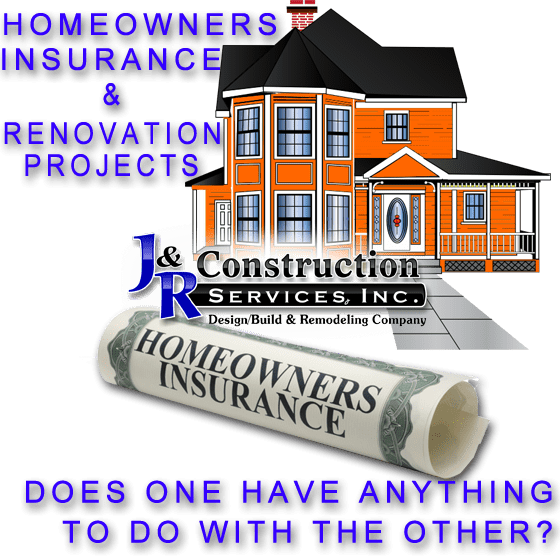 J&R Construction highly suggests homeowners always seek independent, qualified financial, legal, and insurance advice from a licensed, qualified, and reputable professional. Which Home Renovations Add Value?